Now, she holds another chilling surprise. Something's Alive on the Titanic . . . I get completely geeked out over the Titanic. I love to read books about her and yes, I have watched the 1996 movie multiple times. Don't judge, please. 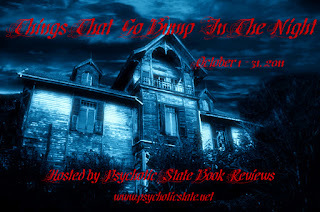 I had not heard of author Robert Serling but meshing the Titanic with the supernatural? Sign me up. To start, the cover does a wonderful job of conveying the story hiding inside. It will make you wonder. Throughout most of the book. And in a good way. Mr. Serling does an admirable job of taking the real 1985 dive of Robert Ballard and suggesting the unthinkable - - that an earlier journey, back in 1975, was actually the first to find the sunken ship. But something kept that expedition from making the history books and kept the Titanic and her secrets at sea. Humans being what we are, of course, we cannot allow the ship and all the possible wealth that may have gone down with her, to remain in her watery grave. Is it possible that the expeditions are being met with nothing more than bad luck or does Titanic and her dead wish to remain as they are - - relics at the bottom of the ocean? While I didn't find Something's Alive on the Titanic to be the type of horror you would associate with someone like Stephen King, I did find it to be mysterious and suspenseful. Just the thought of being many miles down, seeing a part of the ocean that most people never get to see, being the only visibly living thing . . . it made me feel almost claustrophobic. It added to the tensity of the book and gave it a sense of urgency. This book may definitely cause your Titanic addiction to rear its head and while it does bring some actual people to life, it only scratches the surface of the actual Titanic story. If you are looking for an actual recounting of the Titanic's maiden voyage and sinking, this isn't the book for you. If, however, you are open to supernatural possibilities surrounding the Titanic, with some very intense and interesting flashbacks, you definitely want to pick this book up! Fans of Peter Benchley and Steve Alten will certainly appreciate the deep sea adventure and Mr. Serling's tight and concentrated writing. Despite the propensity of many such books to make supporting characters little more than "victims", Mr. Serling gives each character individual and as the reader, you come away caring about them. I thoroughly enjoyed Something's Alive on the Titanic and found it to be a fun and mysterious read. 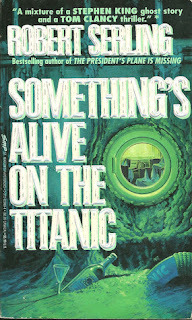 Something's Alive on the Titanic is no longer in print but may be found through various used book sellers, including Amazon. I am an Amazon affiliate. If you make a purchase through my link, I will receive a small commission.